The try/catch/finally construct in Java makes it simple to handle errors and is used ubiquitously. It allows you to associate error handlers to a block of code. Internally, this works by stuffing additional metadata about the error handlers on the call stack. When an exception is thrown, the runtime looks at the call stack for an associated error handler and invokes it; and if no appropriate error handler is found, it propagates the exception up the call chain. This works well for synchronous code, but handling errors in asynchronous and distributed programs poses additional challenges. Since an asynchronous call returns immediately, the caller isn't on the call stack when the asynchronous code executes. This means that unhandled exceptions in the asynchronous code can't be handled by the caller in the usual way. Typically, exceptions that originate in asynchronous code are handled by passing error state to a callback that is passed to the asynchronous method. Alternatively, if a Future<?> is being used, it reports an error when you try to access it. This is less than ideal because the code that receives the exception (the callback or code that uses the Future<?>) doesn't have the context of the original call and may not be able to handle the exception adequately. Furthermore, in a distributed asynchronous system, with components running concurrently, more than one error may occur simultaneously. These errors could be of different types and severities and need to be handled appropriately. Cleaning up resource after an asynchronous call is also difficult. Unlike synchronous code, you can't use try/catch/finally in the calling code to clean up resources since work initiated in the try block may still be ongoing when the finally block executes. The framework provides a mechanism that makes error handling in distributed asynchronous code similar to, and almost as simple as, Java's try/catch/finally. 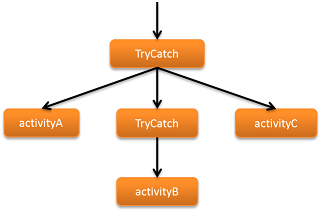 The TryCatchFinally class and its variants, TryFinally and TryCatch, work similar to Java's try/catch/finally. Using it, you can associate exception handlers to blocks of workflow code that may execute as asynchronous and remote tasks. The doTry() method is logically equivalent to the try block. The framework automatically executes the code in doTry(). A list of Promise objects can be passed to the constructor of TryCatchFinally. The doTry method will be executed when all Promise objects passed in to the constructor become ready. If an exception is raised by code that was asynchronously invoked from within doTry(), any pending work in doTry() is canceled and doCatch() is called to handle the exception. For instance, in the listing above, if downloadImage throws an exception, then createThumbnail and uploadImage will be canceled. Finally, doFinally() is called when all asynchronous work is done (completed, failed, or canceled). It can be used for resource cleanup. You can also nest these classes to suit your needs. The execution of an AWS Flow Framework for Java program can be visualized as a tree of concurrently executing branches. A call to an asynchronous method, an activity, and TryCatchFinally itself creates a new branch in this tree of execution. For example, the image processing workflow can be viewed as the tree shown in the following figure. An error in one branch of execution will cause the unwinding of that branch, just as an exception causes the unwinding of the call stack in a Java program. The unwinding keeps moving up the execution branch until either the error is handled or the root of the tree is reached, in which case the workflow execution is terminated. The framework reports errors that happen while processing tasks as exceptions. It associates the exception handlers (doCatch() methods) defined in TryCatchFinally with all tasks that are created by the code in the corresponding doTry(). If a task fails—for example, due to a timeout or an unhandled exception—then the appropriate exception will be raised and the corresponding doCatch() will be invoked to handle it. To accomplish this, the framework works in tandem with Amazon SWF to propagate remote errors and resurrects them as exceptions in the caller's context. In this case, calls to activityA, activityB, and activityC all return successfully and result in the creation of three tasks that will be executed asynchronously. Let's say at a later time that the task for activityB results in an error. This error is recorded in the history by Amazon SWF. In order to handle this, the framework will first try to cancel all other tasks that originated within the scope of the same doTry(); in this case, activityA and activityC. When all such tasks complete (cancel, fail, or successfully complete), the appropriate doCatch() method will be invoked to handle the error. The AWS Flow Framework for Java's cooperative cancellation mechanism allows in-flight activity tasks to be canceled gracefully. When cancellation is triggered, tasks that blocked or are waiting to be assigned to a worker are automatically canceled. If, however, a task is already assigned to a worker, the framework will request the activity to cancel. Your activity implementation must explicitly handle such cancellation requests. This is done by reporting heartbeat of your activity. Reporting heartbeat allows the activity implementation to report the progress of an ongoing activity task, which is useful for monitoring, and it lets the activity check for cancellation requests. The recordActivityHeartbeat method will throw a CancellationException if a cancellation has been requested. The activity implementation can catch this exception and act on the cancellation request, or it can ignore the request by swallowing the exception. In order to honor the cancellation request, the activity should perform the desired clean up, if any, and then rethrow CancellationException. When this exception is thrown from an activity implementation, the framework records that the activity task has been completed in canceled state. The following example shows an activity that downloads and processes images. It heartbeats after processing each image, and if cancellation is requested, it cleans up and rethrows the exception to acknowledge cancellation. Reporting activity heartbeat isn't required, but it is recommended if your activity is long running or may be performing expensive operations that you wish to be canceled under error conditions. You should call heartbeatActivityTask periodically from the activity implementation. If the activity times out, the ActivityTaskTimedOutException will be thrown and getDetails on the exception object will return the data passed to the last successful call to heartbeatActivityTask for the corresponding activity task. The workflow implementation may use this information to determine how much progress was made before the activity task was timed out. It isn't a good practice to heartbeat too frequently because Amazon SWF may throttle heartbeat requests. See the Amazon Simple Workflow Service Developer Guide for limits placed by Amazon SWF. Besides error conditions, there are other cases where you may explicitly cancel a task. For example, an activity to process payments using a credit card may need to be canceled if the user cancels the order. The framework allows you to explicitly cancel tasks created in the scope of a TryCatchFinally. In the following example, the payment task is canceled if a signal is received while the payment was being processed. When a task is completed in canceled state, the framework informs the workflow logic by throwing a CancellationException. When an activity completes in canceled state, a record is made in the history and the framework calls the appropriate doCatch() with a CancellationException. As shown in the previous example, when the payment processing task is canceled, the workflow receives a CancellationException. An unhandled CancellationException is propagated up the execution branch just like any other exception. However, the doCatch() method will receive the CancellationException only if there is no other exception in the scope; other exceptions are prioritized higher than cancellation. You may nest TryCatchFinally's to suit your needs. Since each TryCatchFinally creates a new branch in the execution tree, you can create nested scopes. Exceptions in the parent scope will cause cancellation attempts of all tasks initiated by nested TryCatchFinally's within it. However, exceptions in a nested TryCatchFinally don't automatically propagate to the parent. If you wish to propagate an exception from a nested TryCatchFinally to its containing TryCatchFinally, you should rethrow the exception in doCatch(). In other words, only unhandled exceptions are bubbled up, just like Java's try/catch. If you cancel a nested TryCatchFinally by calling the cancel method, the nested TryCatchFinally will be canceled but the containing TryCatchFinally will not automatically get canceled.